In the hugely successful EVIL PENGUINS Elia Anie bravely exposed the dark underbelly of the animal kingdom. Now with EVIL CATS she is taking on an enemy far closer to home... Think cats are sweet, fluffy creatures with big eyes that can melt even the hardest of hearts? Think again. Violent, devious and utterly amoral, in 95 hilarious cartoons Elia Anie will show all the reprehensible depths to which their behaviour can sink. 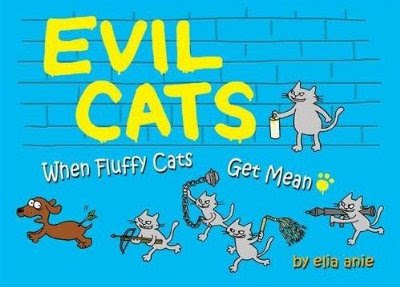 EVIL CATS confirms once and for all that felines are as capable of dastardly deeds as any other member of the animal kingdom. I love cats and have a very cheeky one of my own. I also know that kitties can be very naughty if things aren't going their way. And already love the Simon's Cat films. So when I received this book for review, I couldn't help but smile. I intended to put it aside, and pick it up after I finished reading the book I'd already started, but couldn't put it down. As soon as I opened this book, I found myself turning one page, then another, and another... I kept laughing out loud at what these naughty felines were getting up to. LOL. See, I'm laughing again. And these two pics are just a very small taste of what these fluffy but mean cats get up to in this lovely-looking, little book. It's a fast read, filled with laughs and cringing moments. I had a blast looking at this book and loved that some cat sayings make an appearance too! Awesome. This was a great surprise! I love this book. I found this youtube video of the cartoon on top. Just got this book in the mail today. It's AMAZING. Every page makes me laugh out lout. Sooo recommended.